We all make mistakes, the key is to learn from them and educate others so that hopefully the mistake is not repeated. Part of the reason for making this my first post is the fact I still see people posting selfies with lions or tigers, as well as some travel bloggers promoting cub petting or Walking With Lions. In fact, just recently a very popular travel blogger wrote positive things about The Rhino and Lion Park and their white lions which is one of the parks I will talk about below. Thanks for visiting Wilderness and Wanderlust, I hope you enjoy it! While I’ve been travelling since my early 20’s, it was typically within the comforts of North America. That all changed when I took my first real adventurous trip to South Africa and Swaziland in 2013 at 35 years old. What drew me to South Africa was my passion for wildlife, especially Apex Predators and a strong interest in Zulu Culture. Other than the issues with wildlife poaching I was not yet aware of other issues facing wildlife in Africa, but I was about to learn. The next stop of the day, The Rhino & Lion Park was where my mistakes began, which I’ll explain a bit later on. After walking through the snake enclosures we came to an area with other animals like Giraffe, Cheetah, Leopard, and even Tigers. It peaked my curiosity a bit as to why there were Tigers at a park that was supposed to be about African animals and the conservation of them. The response I received was that they had been rescued from someone who had them as pets which seemed reasonable. It was after walking by all the enclosures of large cats that I got to spend some time in a pen with 3 beautiful 6 month old lion cubs of which I fell for GG who was a sweet lioness. I enjoyed the time I got to play with her, but we still had to do the drive through the lion and wild dog enclosures. This was also quite interesting as they had 2 separate lion prides, one for normal lions and the other for white lions. A pride of white lions is unnatural, but it didn’t click at the time. I later found out the only way a pride of white lions occurs is in captivity through unethical breeding. After driving through the rest of the park I went back to spend more time with GG and wanted to come back to spend the whole day with her. My guide suggested another park where I could interact with more and larger lions instead, so a trip to Ukutula Lodge was planned for the next day. Playing with GG at The Rhino & Lion Park. She was so sweet, I really hope she is alive and OK. 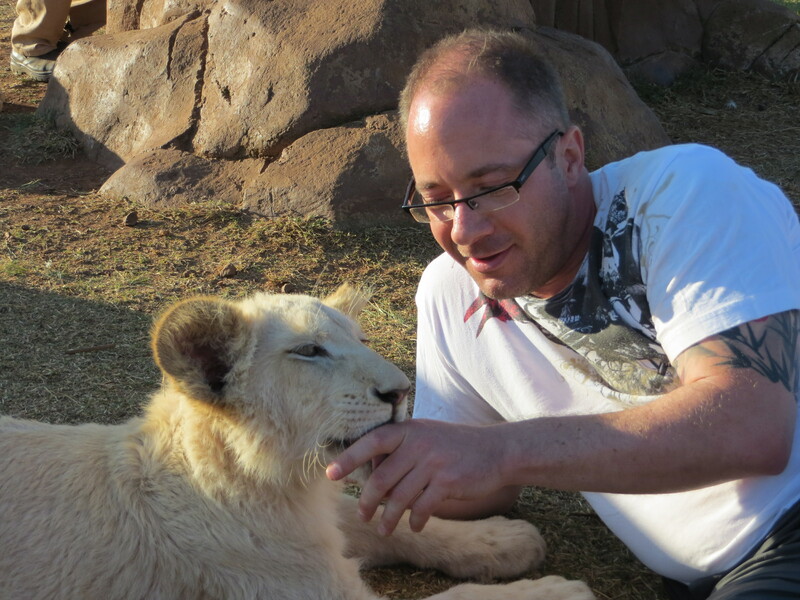 I spent a great day at Ukutula, Walking With Lions and interacting with young cubs from 9 days old to 20 months old. After an exciting morning I decided to adopt a 16 month old lion who I named “Ricky” in honour of my dad as lions are his favourite animal. Doing this gave me the privilege of interacting with him for the afternoon, and after the staff saw how I was with him a second lion was brought in. Eventually I was offered a chance to enter a pen with 7 lions who were 16-20 months old and quite big, also potentially dangerous. I was advised that each of these lions was already capable of taking down prey in the range of 500lbs. It was a fun time and I didn’t feel threated, just had to brace for hugs and kisses from “Armstrong once in awhile. Promises were made that I would get pictures and updates on “Ricky”, none of which happened. As I went public about Ukutula not keeping promises, I began to learn about South Africa’s dark secret – Canned Hunting. 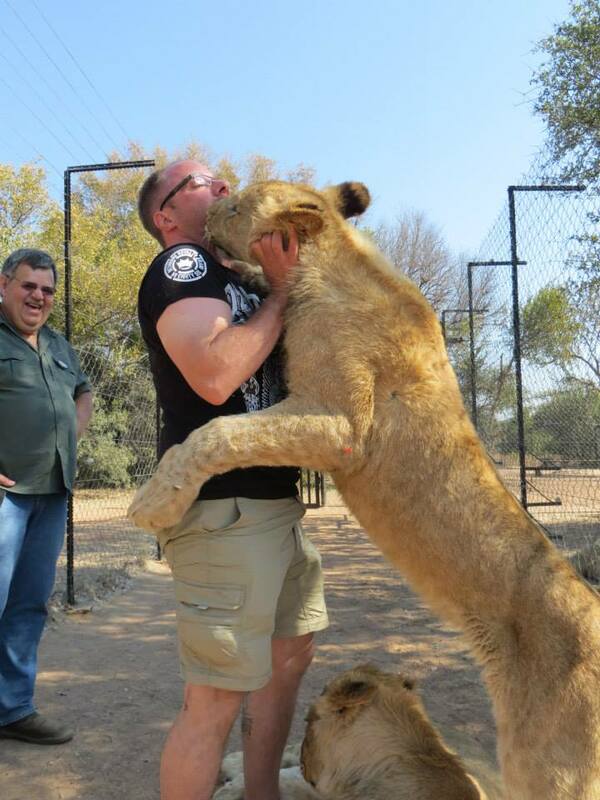 Nothing like bracing for hugs and kisses from a 200lb lion running full speed at you. I really can’t say anything bad about my time at either The Rhino and Lion Park, or Ukutula as both days were great and I fully understand the attraction to interacting with these big cats. These places tell a great and convincing story that they are about conservation that is easy to believe. However, when you learn that the cub you pet will most likely end up dead, it changes your perspective, and I know it’s something I won’t be doing again. Awesome post, Nathan! These parks which turn a hefty profit from lion exploitation really do need to be exposed, and future volunteers made aware of what really goes on behind the scenes. Your experience and learning curve help to educate others and exposes the cruel underbelly of the captive lion breeding industry! Never stop spreading the word! You have learnt much from visiting & volunteering at these places…now it’s time for you to let the world know what the truth is!! You were instrumental in helping me with that first trip as well as the second Jess! Obviously the blog setup & layout needs work, but that can be a work in progress. I think my writeups will be good & eventually I’d like some guest bloggers as well.If you have a way to give me a tab for Daily Trip Hack I’ll put it alongside my G Adventures one in my Travel Links tab. Thanks Nathan. Really appreciate the “Voice of Reason”! Kelly and I are planning a trip to South Africa next year. Will take your advice my friend. Wade, feel free to contact me if you want any tips or connections for your trip to Africa. So glad that your trip to Southern Africa provided so much insight and passion towards the cause. Keep up with the posted….and of course the travelling too!